Codi Frazier pets the horse she calls "Magic Lacey." Like a lot of 10-year-olds, Codi Frazier wants to go to Disneyland and Sea World. What Codi lacks is the luxury of time. A fourth-grader at Cummings Elementary School, Codi is battling inoperable cancer. Her family, the school community and several Keizer organizations are rallying to help her realize her dream. "Codi has a great support network," said her aunt, Loni Barrett, with whom Codi lives. "Cummings Elementary has been absolutely wonderful. I can't imagine any school being more helpful." The school remains an important part of her life, despite a prognosis that she may have as little as two to three months to live. Codi knows her time may be limited, but she loves to go to school. "The school is such an important part of her life, and she wants to be there," said Barrett. "I just have to let her go to school." Codi was first diagnosed with a form of bone cancer in July 1999, when she was living in Las Vegas with her family. She had been taken to the doctor with what seemed to be a knee injury. Then X-rays revealed the cancer, and doctors opted for amputation of the affected leg and an aggressive form of chemotherapy. In 2001, the little girl's world again was shaken by the death of her mother due to a sudden illness. Codi subsequently came to live with her aunt's family in Keizer. She enrolled in Cummings School, where she got along so well with her prosthetic leg that she quickly fit in on the playground and in the classroom. The rest of her family was in the process of moving to Oregon last October, when Codi again fell ill. This time, the diagnosis was diabetes. School officials helped the family get help from the Shriners Hospital in Portland, which provides free medical treatment for children with certain conditions. Doctors put her on insulin therapy, which her aunt said seemed to be help. Codi, always thin, began to gain some needed weight and the color returned to her cheeks. Late last month, the family faced bad news again. A routine health screening discovered a tumor in Codi's chest. Barrett said the cancer has affected her heart and lungs, and doctors think it may also have reached her lymph nodes. "It's inoperable and, at this point, there's no cure," said Barrett. Still, Codi has been accepted for a trials of a new drug that is being tested on mostly adult patients with inoperable cancer. There were only 36 openings nationwide for the tests, and she met all the criteria to participate. "So we're hopeful about that," said her aunt. Meanwhile, the family is thankful for the support of the community. Codi continues to be involved in the American Cancer Society and is an honorary member of the Salem Kiwanis. She also gets support and friendship at her church, Westminster Presbyterian in Salem, where the minister is a family friend. At Cummings School, Codi's teacher Jennifer Bethers has helped her students come up with piles of get-well notes and letters. The school staff has been pulling together resources to send Codi's entire family to Disneyland and Sea World, perhaps in the next couple of weeks, according to Char Sachtjen, Cummings principal. Sachtjen and Jeannie Tolman, the school's volunteer coordinator, visited the Keizer Rotary Club last week to tell Codi's story. Members passed the hat and raised more than $2,000 to help the family. Sachtjen said the spontaneous show of generosity left them trembling. "We were truly overwhelmed and awestruck," she said. School officials also have set up a trust account through the school district for Codi and also contacted the Make a Wish Foundation, which could pay for part of the trip expense. Two local businesses, Town & Country Lanes and Fire & Soul, are planning fund-raisers in the coming week. In the meantime, Codi has realized another dream - to ride a horse. Barrett said that wish arose on the difficult drive home from Portland after the screening that revealed the cancer. "It was very quiet in the car, and I was asking myself what I was going to do," she said. "All I knew was that I wanted to give her anything she wanted, to make the rest of her life really happy." A few minutes passed and then Codi saw some horses in a field along the highway. She asked, as children do, if she could have a horse. "Now what am I going to do?" Barrett remembered asking herself. She mentioned the request the next day when she stopped by the school, and within an hour office manager Genie Reveia had rounded up a small herd. 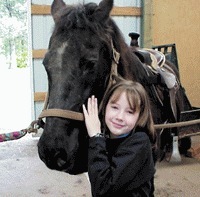 Fifth-grade teacher Sandra Weiss-Plunkett and instructional assistant Neal White both had horses to share, and Codi was "given" a gentle horse named Lacey to ride. After Codi's first riding experience, she told her aunt that she had realized two dreams that day: to get her own horse and "to gallop." Barrett said that through it all, Codi has shown an irrepressible spirit. "She says 'I'm going to live every day,'" Barrett said. "She's talking about living life to the fullest. You couldn't have a better attitude than that." Several fund-raisers are planned to help the family of Codi Frazier with expenses related to her medical care and the trip that will realize her wish to visit Disneyland. Bowl for Codi, a fundraiser sponsored by Town & Country Lanes, will be held from 10 a.m. to 5 p.m. this Friday at the Keizer bowling center. Bowlers can solicit pledges or make donations during a special bowling party. Those with pledges of $25 or more can bowl for free. Soul for Codi will combine music and a wine and cheese tasting from 6:30 to 10 p.m. next Wednesday at Fire & Soul, the coffeehouse and pottery painting studio at 126 Chemawa Road N. David Donestes, the guitarist and vocalist of Westmark, will perform. Admission is $7 per person, and all proceeds will be donated to a fund for Codi. Cummings Elementary has set up a trust fund through the Salem-Keizer School District. Principal Char Sachtjen said donors can make checks out to Cummings School and write "for Codi Frazier" on the check.